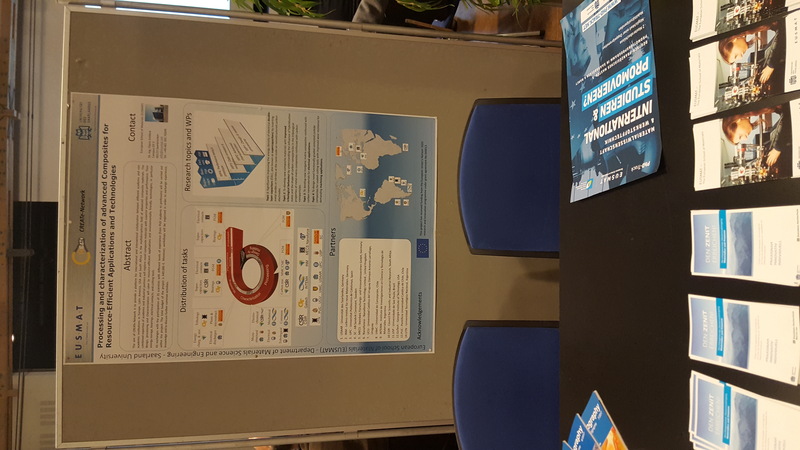 The aim of CREATe-Network is to provide a platform for international and intersectoral collaboration between different academic and non academic institutions in Europe, Latin America, USA and South Africa in the multidisciplinary field of advanced composite materials. The combined expertise of academic and industrial partners will explore novel composite materials with superior properties and performance. 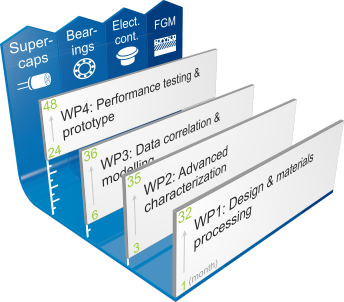 Their design, processing and characterization will cater to resource-efficient applications and environmentally friendly technologies, in particular energy storage, bearings, electrical contacts, and cutting tools. 65 exchanges with the participation of 35 scientists with different levels of experience (from PhD students to professors) will be carried out within the project. The total budget of the project is 640.000 â‚¬. Moreover, workshops will be organized in order to exchange experience, knowledge and to discuss further common activities. Topic 1: Significantly improving the energy density of electrical double-layer capacitors (EDLC, also known as supercapacitors) by inserting metal oxides or nitrides at the nano-scale on nanostructured carbon electrodes. EDLCs are an emerging technology for electrical energy storage due to their reliability as well as their high power density (significantly higher than batteries). Although the energy density is still one order of magnitude smaller than lithium-ion batteries, the synergistic implementation of redox-active elements can greatly enhance performance. If carried out correctly, potential longevity setbacks due to redox reactions can be avoided. For this, we will implement tunable carbon nanomaterials, such as onion-like carbon (OLC), and nanoporous carbons such as carbide-derived carbon which will be hybridized with metal oxides (e.g. MnO2, V2O5), metal nitrides (e.g VN), and functional groups (e.g. quinones). Electrochemical durability testing will allow to address the key issue of performance stability for real world applications. Topic 2: To develop new composite materials with improved tribological behaviour by understanding the influence of hybridisation states as well as the shape of carbon nanoparticles in the tribological properties of metal matrix composites reinforced with carbon nanoparticles. Carbon nanomaterials such as carbon nanotubes (CNTs), onion-like carbons (OLC) and nanodiamonds (NDs) have been identified as very interesting reinforcements for metal matrix composites. Boosted strength has already been achieved by using CNTs and NDs. However, OLC-composite processing has yet to be reported. In the case of CNTs and NDs, composites still have room for improvement (better dispersion and homogeneity, better microstructural control regarding grain sizes and interphases) in mechanical properties and tribological tailoring. Lower friction through self-lubricating layers, for example, is a decisive point considering the lack of understanding concerning the lubricating properties of these carbon-based reinforcements. Topic 3: To develop new inorganic matrix composites reinforced with carbon nanomaterials for electrical applications. On one side MMCs for electrical contacts with improved resistance against electro erosion, reduced contact resistance and improved mechanical properties will be developed. Such innovative materials should lead to longer lifetime, reduced device weight and energy losses, as well as material savings. Electrical contacts are often made of noble metals reinforced with ceramic particles (e.g. SnO2, In2O3, WO3) intended to avoid post-operation welding and increase resistance against electro-erosion. However, the electrical and thermal properties are thereby deteriorated and the device performance reduced. CNT, ND and OLC reinforcements have the potential to maintain anti-welding properties without compromising electrical (in the case of CNTs) and thermal conductivity (in all cases). On the other side ceramic matrix composites reinforced with carbon materials with improved electrical and thermal conductivity will be developed. The increment of electrical conductivity opens the possibility of using electrical discharge machining for the final shaping of these materials. In this case, the erosion produced by the discharges is used for accurate and energy efficient machining of components. Topic 4: To design novel functionally graded cemented carbide composites for coated cutting tools with improved wear resistance for demanding machining applications in the aerospace and automotive industries, such as machining of high alloyed Fe-based alloys, titanium and high temperature alloys and carbon-reinforced composites. This goal can be achieved by designing the microstructure features and the processing methods in order to produce functionally graded materials that can withstand the demanding conditions regarding hardness, toughness and deformation at high temperatures. The design (assisted by computational modelling at all scales) will focus on investigating novel functionally graded microstructure concepts considering size and distribution of carbides as well as carbide-metal binder and cemented carbide–coating interfaces. Understanding the wear mechanisms in order to design custom made materials for specific applications is a demanding task since many different processes act simultaneously in the cutting tool-work piece interaction (i.e. fatigue, creep, corrosion, oxidation, thermo-mechanical impact, etc.). The wear response of the novel materials will be studied combining phenomenological and analytical methods, with the aim of establishing models for the description and prediction of properties connected to wear at the different applications. This project has received funding from the European Union's Horizon 2020 research and innovation programme under grant agreement No 644013. - Session P03.2: CREATE-Network (Horizon 2020 â€“ RISE Project of the European Commission), with presentations of joint activities results by Yasmin Maril (University of ConcepciÃ³n), Idriss El Azhari (Saarland University), Maiara Moreno (University of Sao Paulo), Silvia Simison (INTEMA), Haroldo Pinto (University of Sao Paulo), Esteban Ramos Moore (Catholic University of Chile). -	Project Meeting with the participation of 25 representatives of the different partners. 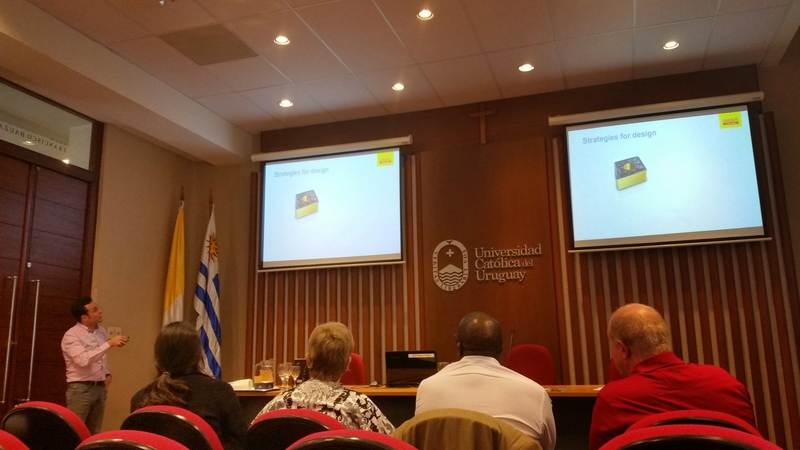 In the meeting, a summary of the activities done so far was presented by Flavio Soldera and the next activities until the end of the project and the preparation of the reports were arranged. Finally, possibilities for additional cooperation in the future was discussed. During their respective exchanges, Members of MECS, Saarland University and the Catholic University of Chile participated in meetings in Stockholm. Dominik Britz from MECS gave a presentation about his research on the characterization of microstructures and data analysis. On September 6 and 7 the third CREATe-Network meeting took place in SaarbrÃ¼cken. CREATe is a research network that establishes international and interdisciplinary contacts between industry and universities. CREATe particularly combines researchers from Europe, Latin America, the USA and South Africa who are conducting research in the field of composite materials. CREATe is part of Horizon 2020 and has a total budget of â‚¬640,000. The project started in January 2015 and will last until December 2018, when the goal is to have completed 65 research exchanges. 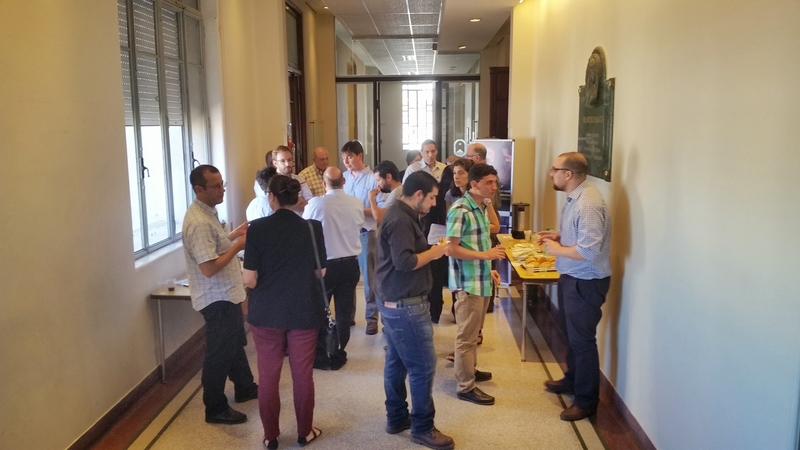 The Mid Term Meeting of CREATe-Network took place at the new campus of the Barcelona East School of Engineering of the Politechnical University of Catalonia. 16 representatives of the different partners presented their activities done in the frame of the project and their main results. Also a representative of the European Commission, Ms. Alina Suhezki, participated in the meeting giving valuable suggestions for the further implementation of the exchanges and research activities. Besides the scientific discussions, organization of further activities was arranged. 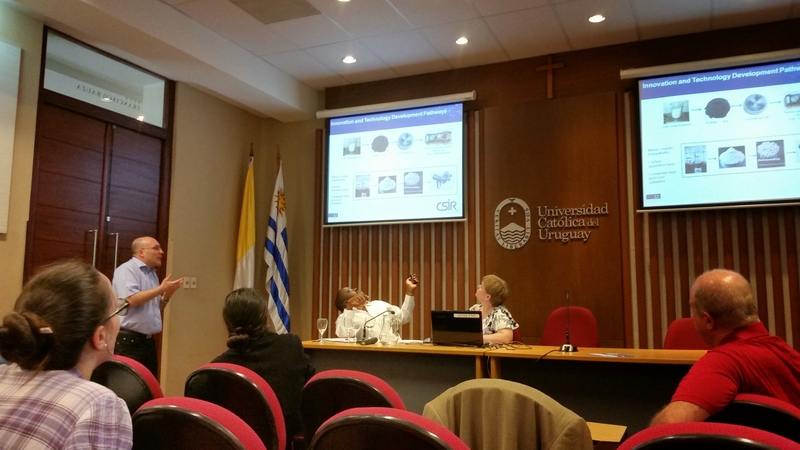 The first meeting of the CREATe-Network project took place at the Catholic University of Uruguay, Montevideo, Uruguay. This was an excellent opportunity to get to know the partnersâ€™ research more in detail. 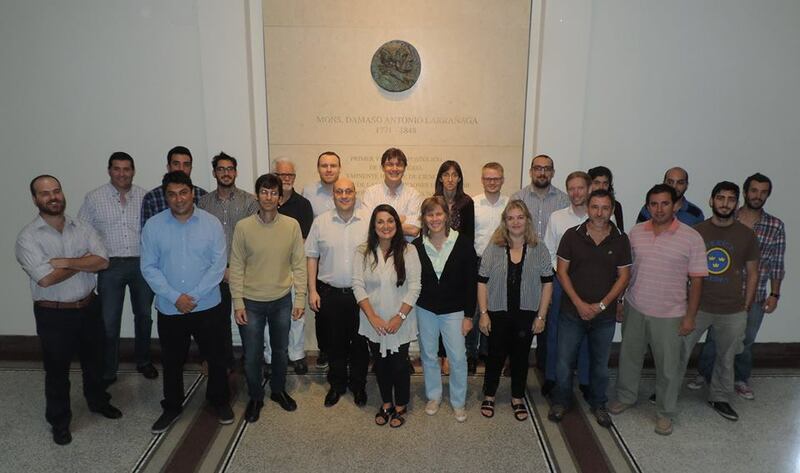 The 21 participants from Uruguay, Argentina, Germany, Sweden, Spain, South Africa, and USA discussed the common activities to be carried out within the 4 years of the project. 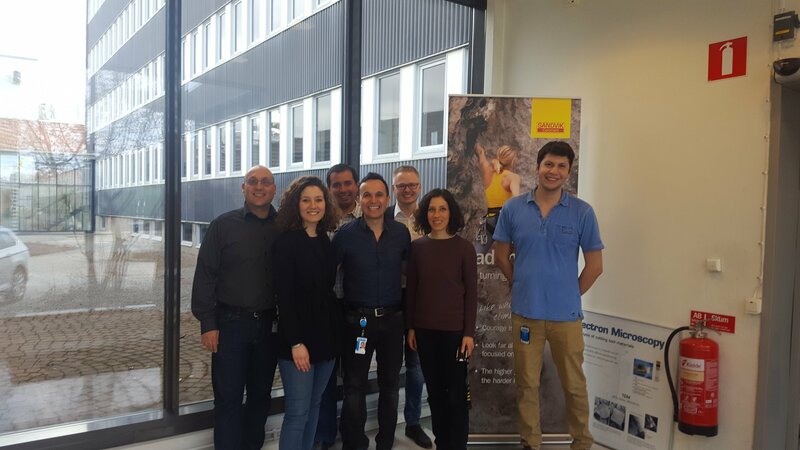 This month we had the pleasure of receiving Prof. Daniel Sosa from INTEMA and Universidad Nacional de Mar del Plata in Argentina. He visited us within the frame of our EU-Projekt CREATe-Network. 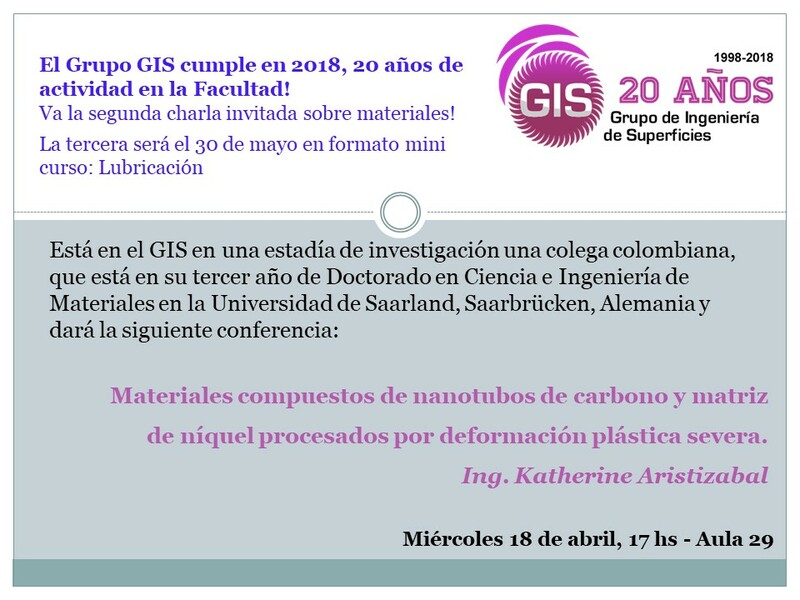 Katherine Aristizabal from Saarland University gave a Seminar at the Universidad TecnolÃ³gica Nacional (ConcepciÃ³n del Uruguay in Argentina) during her research exchange within the frame of the 20 year celebration of the surface engineering group. 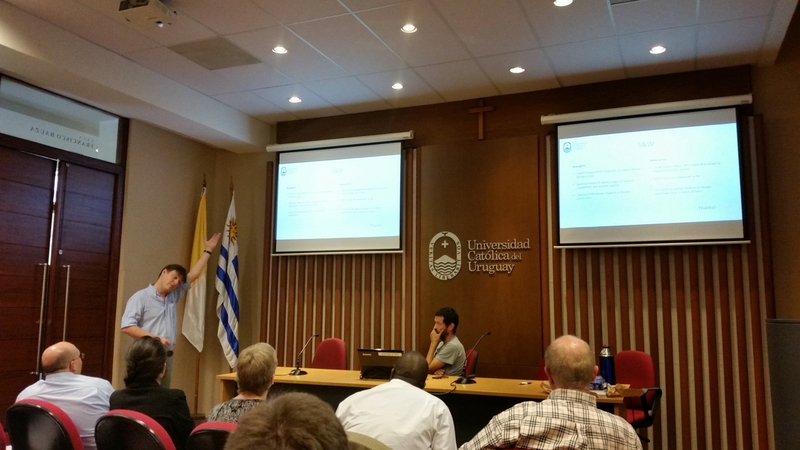 Dr. Agustina Guitar and Dr. Sebastian Suarez from Saarland University visited Universidad TecnolÃ³gica Nacional in Argentina, our new partner in the CREATe-Network and held seminars within the frame of activities related to the 20th anniversary of the Surface Engineering group. 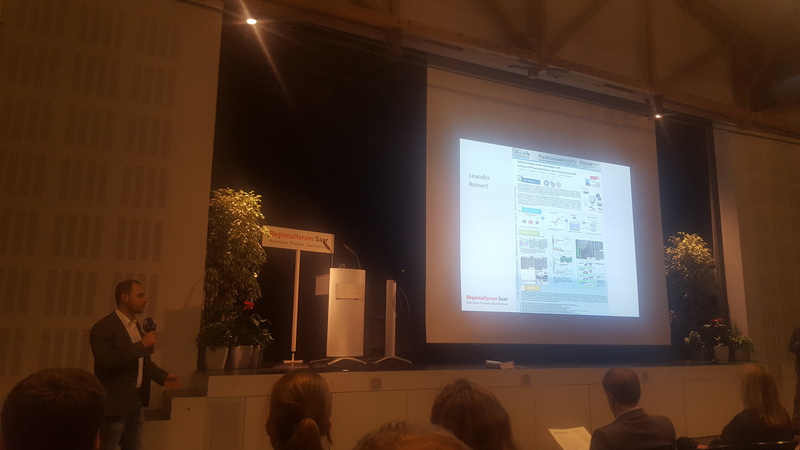 In the frame of the Regional Forum Saarland, our PhD-student Leander Reinert obtained a price for one of the best 3 Posters. Leander works in a topic related to the activities of CREATe-Network - "Self lubricating surfaces based on carbon materials" and participated in an exchange to Georgia Tech. 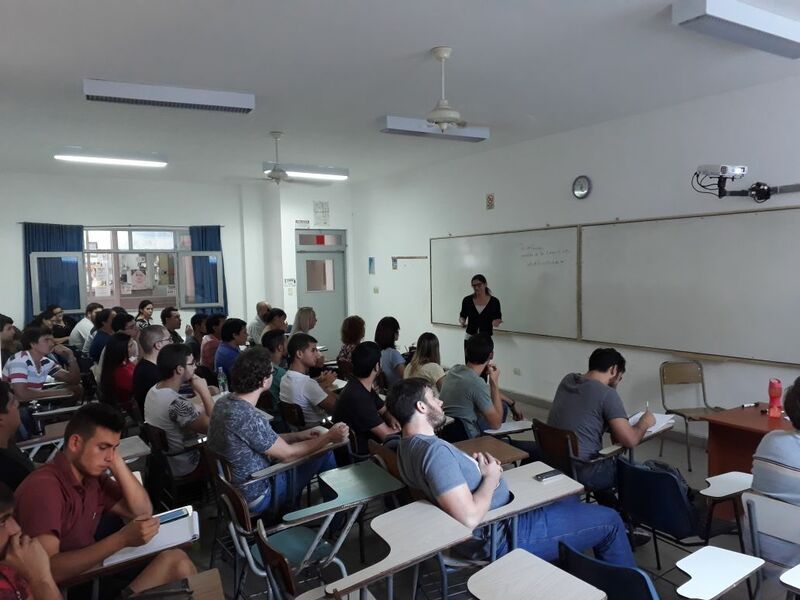 At this event, in which about 125 persons not only from the university but also from the local industry participated, the CREATe-Network project was also presented. From March 15th to 25th we received the visit of Prof. Itzhak Green from the George W. Woodruff School of Mechanical Engineering, Georgia Institute of Technology, USA. His visit was sponsored by EUSMAT within the AMASE and the CREATe-Network projects. During his stay, we continued our collaboration in the field of contact mechanics and tribology of metal matrix composites reinforced with carbon nanoparticles. Additionally, Prof. Green gave a seminar on contact mechanics and modelling to our research staff. 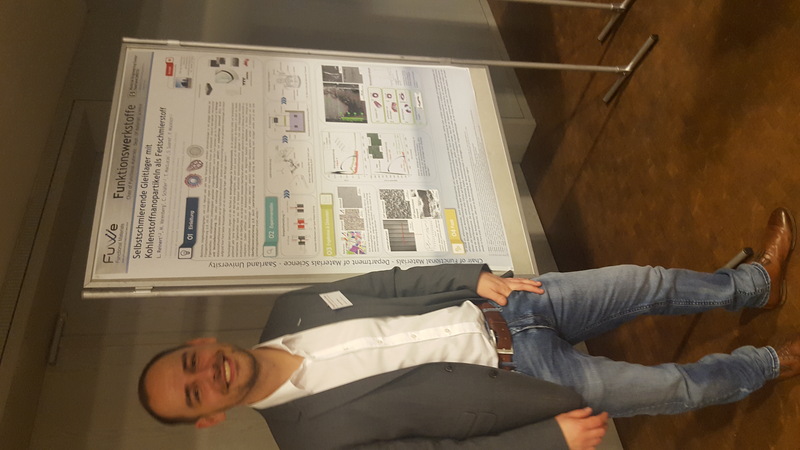 Congratulations to Ph.D student, Idriss El Azhari on being awarded the 1st prize in the poster competition at NanobrÃ¼cken 2016 Workshop, hosted by INM - Leibniz Institute for New Materials, SaarbrÃ¼cken, Germany in cooperation with Hysitron, Inc. on March 2-4, 2016, SaarbrÃ¼cken. 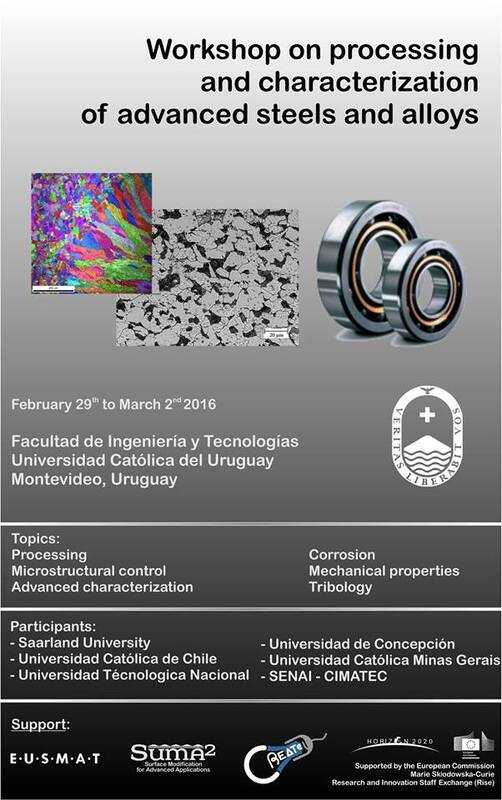 The presented work consisted in the investigation of micro-mechanical properties of TiCN and ZrCN coatings. Mr. Idriss El Azhari is currently doing his Ph.D at Saarland University under the supervision of Prof. Frank Mücklich and in cooperation with Prof. José Garcia (Sandvik Coromant R&D, Stockholm-Sweden). The poster can be downloaded in the members' area. Congratulations to Ms. Thais Carvalho Miranda and Dr. Sandra Vales for succesfully passed their thesis defense. Miss Carvalho obtained her Master in Engineering degree. The topic of her thesis was: 3D FIB tomography of wear pattern in milling inserts. Dr. Sandra Vales's PhD thesis deals with the influence of Xe+ ion bombardment and plasma nitriding on the behaviour of TiN coating deposited on steels. Both students were supervised by Prof. Haroldo Pinto in cooperation with Prof. José Garcia (Sandvik Coromant R&D, Stockholm-Sweden). More information can be found in the members' area. 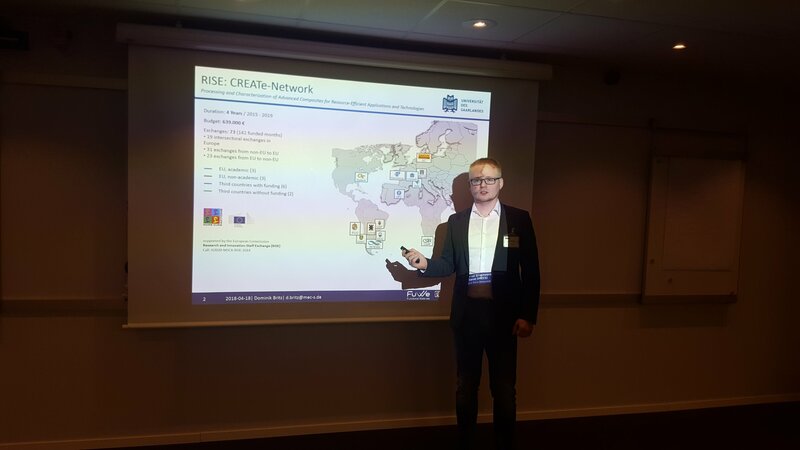 CREATe-Network is composed of 3 academic institutions in Europe (Saarland University; Technical University of Catalonia; and INM - Leibniz Institute for New Materials), 3 non-academic institutions in Europe (AB Sandvik Coromant; Materials Engineering Center Saar; and Nanoforce Ltd.), as well as 8 academic partners outside Europe (CSIR - Council for Scientific and Industrial Research; Universidad CatÃ³lica de Uruguay; INTEMA; Universidad de ConcepciÃ³n; Univ. Sao Paulo, Georgia Institute of Technology, Universidad CatÃ³lica de Chile and Universidad TecnolÃ³gica Nacional Argentina). The network cooperates in the field of design, processing and characterization of novel composite materials for resource-efficient applications and environmentally friendly technologies, in particular energy storage, bearings, electrical contacts, and cutting tools. The purpose of the network is to combine the expertise of the academic and industrial network members in order to design new composite materials with superior properties and performance. The cooperation is based on the exchange of researchers from academy and industry, complemented with network workshops and conferences. Top 1: First, metal nitrides were studied for electrochemical energy storage technologies. However, its electrochemical stability was insufficient. Therefore, we moved on to carbon nanoparticle/metal oxide systems. Using hydrothermal synthesis, we showed a 10-fold increase in energy storage capacity when using manganese oxide/carbon hybrids. Using atomic layer deposition, we achieved battery-like energy storage capacities when using titania/vanadia metal oxides. Using nanoscale engineered carbon fiber/carbon nanoparticle electrodes, we enhanced the energy storage capacity by a factor of 5-6. This was possible by capitalizing on the high electrical conductivity of the carbon fibers and the large surface area provided by carbon nanoparticles. A key factor to enable the high performance was the use of redox-active surface groups at the fluid/solid interface. Top 2 and 3: production of composites reinforced with carbon materials. The best distribution of carbon nano particles (CNP) within the metallic matrix was achieved for the nanodiamond (ND)-containing composites, followed by onion like carbon (OLC) and by carbon nanotube (CNT). This feature is related primarily to the hybridization of the C atoms in the nanoparticles and in the case of OLCs and CNTs (both sp2) the difference is related to their shape, since CNTs tends to enhance their interlinking, resulting in larger agglomerates. A new developed processing route which takes advantage of the optimal dispersability of sp3 carbon (nanodiamonds), allows to control the sp3/sp2 ratio by a thermal treatment, and thus to tailor the global physical properties. Very high densification was achieved by hot pressing and by spark plasma sintering, without compromising the structure of the CNTs. Top 2: with tribological tests and modeling of contact mechanics, we were able to identify the self-lubricating mechanisms brought by the CNPs and its influence on friction and wear. The embedded nanoparticles produce a continuous feeding of solid lubricant which reduces the overall coefficient of friction. This effect has been even enhanced by combining composites with a surface structuring and a coating with CNPs. Top 3: test facilities were developed for studying contact resistance of composites. The thermal diffusivity and electrical conductivity of the composite could be slightly increased against the pure metal, having the reduction of contact resistance a much more significant effect, opening good perspectives for this material to be used as electrical contact. Low voltage sparking experiments showed that the composites have a reduced arc duration and energy input, which translates into a larger duty-life. Top 4: cemented carbides with different binders were produced by hot pressing consolidation and liquid phase sintering, presenting a functionally graded microstructure regarding chemical composition, particle size of WC and hardness profiles. We developed a method to analyze in-situ the thermal stress behavior during an individual thermal cycle. Despite of the functionalization of the surface, the alternating stress behavior cannot be avoided indicating that the overall composition of the cemented carbide strongly affects the stress behavior of the system. The addition of Cr and (Ta,Nb)C to the WC-Co substrate enhances the corrosion resistance of the binder, reducing fatigue induced cracks. Differences between the coatings (ZrCN and TiCN) in thermomechanical experiments could be explained with the help of Finite Elements Simulations and is based on the different mechanical behavior. Finally, prototypes of different carbide variants and coatings could be tested in plane milling of motor blocks made of cast iron, showing that Zr(CN) coatings improved the resistance to crack formation and propagation. The novel solutions proposed in the fields of energy storage, low friction materials, electrical contacts and cutting tools have shown very promising results in performance under operating conditions, highlighting the fact that they could indeed replace current typical materials. The solutions are based in green, low-environmental impact materials (i.e. carbon-based), which further supports the initial goal of developing resource-efficient alternatives. â€¢ Energy storage: New carbon based materials show enhanced specific energy and power when compared to current materials. 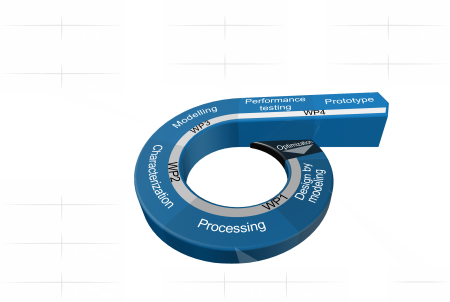 The developed synthesis route is straightforward and optimizes the utilization of resources. â€¢ Low-friction self-lubricating materials: Increased duty life by the efficient reduction of wear and improved energy efficiency by a significant reduction in friction. These advanced composite materials with reduced friction and wear may help saving energy costs. â€¢ Electrical contacts in automotive branch: increased reliability through efficient circuit breaking and extended duty life. Metal matrix composites reinforced with carbon materials improve the performance of electrical contacts, allowing for a reduction of weight in the contact system. This is especially important in transportation, since a reduction in weight and energy loses implies a reduction of fuel consumption. Finally, with the proposed solution, it is possible to reduce the use of expensive noble metals like Ag or rare elements like In. â€¢ Cutting tools: An extension of the applicability range to hard-to-machine metals was achieved. Furthermore, the extension of the duty life of machining tools can reduce, on one side the energy consumed in machining pieces and, on the other side the consumption of strategic important materials like for instance tungsten. The scientific impact of the project is evident in the large amount of publications in important journals (37). Finally, highly-qualified human resources could be developed. Through extensive knowledge exchange, participating early stage researchers were able to not only gain insights into relevant scientific topics, but also to be in permanent contact with leaders of the industry. Through the enhancement of existing scientific cooperation and the cultivation of new ones, the participants of the network were able to found new common interests and start new cooperative research lines. In Topic 1 metal nitrides were studied for electrochemical energy storage technologies. However, its electrochemical stability was insufficient for actual applications. Therefore, we moved on to carbon nanoparticle/metal oxide systems. Using hydrothermal synthesis, we showed a 10-fold increase in energy storage capacity when using manganese oxide/carbon hybrids. Using atomic layer deposition, we achieved battery-like energy storage capacities when using titania/vanadia metal oxides. Using nanoscale engineered carbon fiber/carbon nanoparticle electrodes, we enhanced the energy storage capacity by a factor of 5-6. This was possible by capitalizing on the high electrical conductivity of the carbon fibers and the large surface area provided by carbon nanoparticles. A key factor to enable the high performance was the use of redox-active surface groups at the fluid/solid interface. The use of aqueous electrolyte makes this technology particularly cost attractive. The topic 2 and 3 are related to the production of composites reinforced with carbon materials. We were able to correlate the different ultrasound exposure times of the nanoparticles (NP) to the final agglomerate size in the composites. The best distribution within the metallic matrix was achieved for the nanodiamond (ND)-containing composites, followed by onion like carbon (OLC) and by carbon nanotube (CNT). This feature is related primarily to the hybridization of the C atoms in the nanoparticles (sp3 is chemically more inert than sp2, thus reducing the agglomeration). Within the sp2 hybridized particles (OLCs and CNTs), the difference is related to their shape. The shape of CNTs tends to enhance their interlinking, resulting in larger agglomerates. Very high densification was achieved by conventional hot pressing and spark plasma sintering, without compromising the structure of the CNTs, retaining their intrinsic properties. Taking in account the grain size of the nickel matrix composites, a Zener-based model could be successfully adapted to predict the grain refinement for all the carbon nanoparticles. It was shown, that this model is perfectly valid, as long as no saturation value of the refinement effect is reached (furhtermore saturation level depends on the size of agglomerates). Concerning the tribological behavior, we were able to identify the self-lubricating mechanisms brought by the Carbon Nano Particles (CNP). This mechanism is straightforwardly transferred to the case of composite materials, where a continuous feeding of solid lubricant (in this case, the CNP) reduces the overall coefficient of friction. In Topic 4 functionally graded cemented carbides with different binders were produced by hot pressing consolidation and by liquid phase sintering. The main objective was to produce bi-layers consisting of different cemented carbide compositions, sintered in sequential steps. The consolidated samples present a functionally graded microstructure regarding chemical composition, particle size of WC and hardness profiles. The study of residual stresses conditions has been successfully completed. We developed a method to analyze in-situ the thermal stress behavior of Ti(C,N) deposited on graded cemented carbides during an individual thermal cycle. We came to the conclusion that, despite of the functionalization of the surface, the alternating stress behavior cannot be avoided indicating that the overall composition of the cemented carbide strongly affects the stress behavior of the coating/substrate systems. A methodology for the 3D-characterization of wear features by serial sectioning techniques was successfully developed and applied to a 3D visualization strategy of comb cracks in milling inserts. The study of their oxidation and corrosion behavior showed that the addition of Cr and (Ta,Nb)C to the WC-Co composition enhances the corrosion resistance of the binder, which may reduce the formation of fatigue induced cracks in the presence of cooling media. Thermodynamic modeling showed that tailored hardness/toughness can be produced by adjusting the WC particle size and binder content on both sides of the bi-layer composite. All the aforementioned acquired knowledge has been presented in international conferences and 25 peer-reviewed papers in renowned scientific journals. 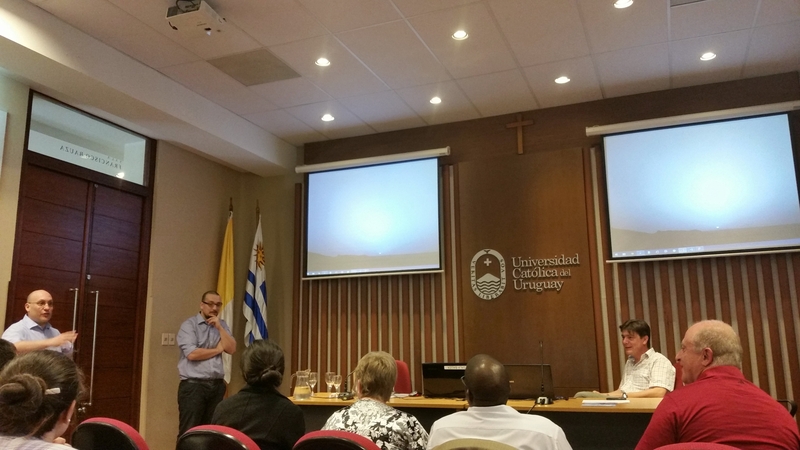 A project kick-off meeting was organized in March 2015 at the Unviersidad Catolica del Uruguay. In February 2016, the same University organized with the support of EUSMAT a workshop on Processing and Characterization of Advanced Steel and Alloys. About 25 international researchers (most of them participants in the EU projects SUMA2 and CREATe), met to discuss about new research results in this topic. 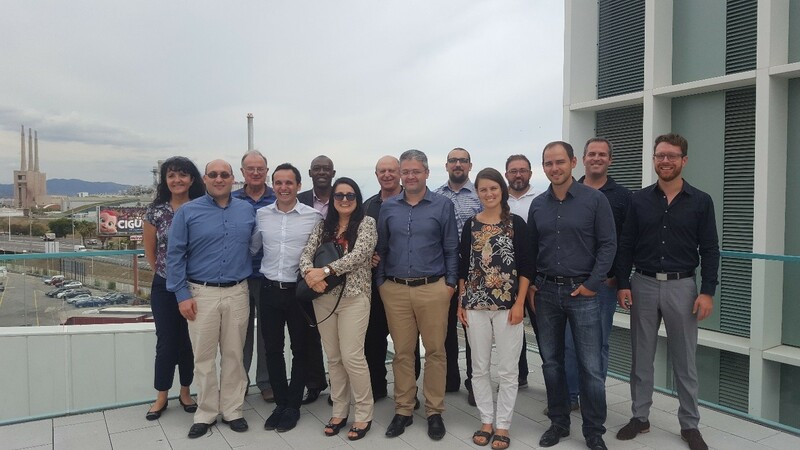 On Spetember 2016, a project meeting was carried out in Barcelona, where the progress of the project was discussed. "This work was supported by the CREATE-Network Project, Horizon 2020 Program of the European Commission (RISE Project NÂ° 644013)"
Local repository: Author's accepted manuscript will be available at SciDok repository (https://publikationen.sulb.uni-saarland.de) in July 2019, after the 12 months embargo period has expired. The group headed by Prof. Mücklich is composed by 4 Post Docs, 25 PhD students and several Master and Bachelor students. The group is leader in the development of methods for 3D imaging and quantitative analysis of microstructures, in particular FIB tomography and Atom Probe Tomography. It has vast experience in the structuring of metallic, polymer and ceramic materials with laser interference as well as in the study of materials for electrical applications, such as electrical contacts. A group dealing with the processing of CNTs and manufacturing of CNT based metallic composites was established 6 years ago, gathering experience in several fields such as CNT-reinforced composites, CNT chemical processing and functionalization and CNT synthesis. Processing/structuring: Laser Interference (nano-second), Laser Structuring (fs, ps), Laser Cladding, Electron Beam Deposition, Ion Beam Sputtering, cold pressing, access to hot uniaxial press. Characterization: FIB/FE-SEM-Dual Beam, Atom Probe Tomography, FIB-tomography, EBSD, EDX, X-ray diffraction, white light interferometry, laser scanning microscope, metallographic laboratory. Properties Characterization: Nanotribometry, Friction, Wear, Electroerosion, Electrical Properties, Wetability. The Energy Materials Group headed by Jun.-Prof. Dr. Volker Presser is currently composed of 2 Research Associates, 3 Postdocs, 5 Master students, and 2 Bachelor students. The core area of expertise of Presser’s Energy Materials Group is the synthesis, characterization, and application of carbon and carbon-hybrid materials (both porous and non-porous). In particular, the group has specialized in electrochemical technologies, such as electrical double-layer capacitors, electrochemical capacitors, pseudocapacitors, capacitive deionization for water treatment, and capacitive energy extraction from chemical gradients. The Energy Materials Group was established at the INM – Leibniz Institute for New Materials in 2012 and capitalizes and extends the expertise of PI Presser during his time as Research Assistant Professor at Drexel University, Philadelphia (USA) from 2010 – 2012 working on energy storage materials and technologies. The researchers involved are of two research groups of the Department of Material Science and Metallurgy (CIEFMA and PROCOMANE) that are involved in research of composite inorganic materials. 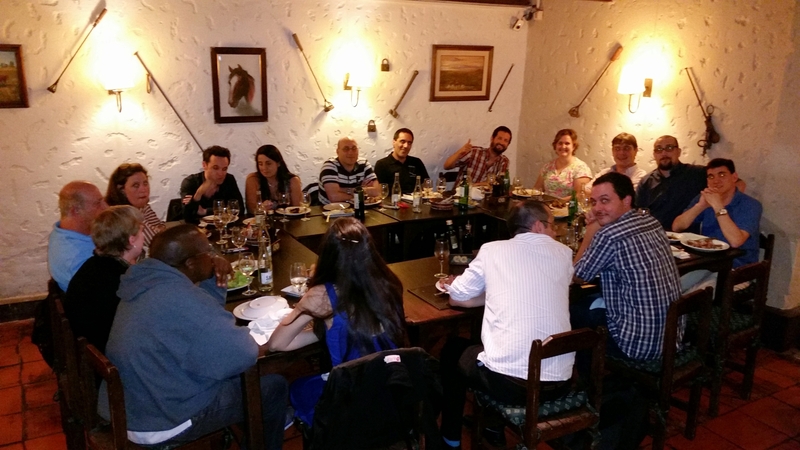 In total, both groups have about 40 members including Post Docs and PhD students. Both groups have large experience in the relationship between structure and mechanical properties of nanostructured materials, inorganic matrix composites, cemented carbides, and hard coatings. Several research projects are under way on metal and ceramic matrix carbon reinforced composites, hard coatings and on the study of contact mechanics, friction and wear of these materials. Two scanning electron microscopes, one Dual SEM/Focus Ion Beam with electron tomography, one transmission electron microscope, laser confocal microscopy, Nanoindentation techniques, Scratch and wear testing, 2 AFM VEECO, DRX instruments, XPS X-ray photoelectron spectroscopy, Infrared /UV Spectroscopy, UV-visible-NIR Spectrometer, optical interferometer, profilometer, micro and macro testing machines, fatigue machines, specimen preparation laboratory. Sandvik Coromant is a high-technology engineering Swedish company with advanced products and world-leading positions in machining solution areas. Sandvik Coromant's business concept is based on a unique competence in materials technology. This has resulted in innovative products made of cemented-carbide, other hard materials and high-speed steel tools; but also the design of tooling systems for metalworking applications and blanks and components made of cemented carbide and other hard materials for automotive, aerospace and other industrial segments. Softwares for modelling (ab initio, thermodynamic and kinetic modelling). Powder metallurgy laboratory. Sintering furnaces. CVD and PVD coating furnaces. High resolution microscopy (incl. SEM, TEM and FIB). X-ray laboratory. Testing of mechanical properties (nano Hardness, tribology). Machines for testing of cutting performance in selected applications (turning, milling, drilling,…). The Steinbeis Forschungs-und Innovationszentren GmbH is a non-centralized organization aiming to provide research and development services to businesses. It fosters partnership and knowledge-sharing between academic institutes and business, by making knowledge and technology available at the source, adhering throughout to the rules of the markets and free enterprise. The SFI is composed of 918 enterprises of very different disciplines. The Material Engineering Center Saarland (SFI-MECS) is one of the enterprises belonging to the Steinbeis Network. SFI-MECS was founded in June 2009 to improve the scientific transfer between academia and private enterprises in the field of materials science and engineering. SFI-MECS provides founded expertise in applied research in the fields of micro/nano-characterisation of materials, materials for electrical applications, tribology and failure analysis. SFI-MECS is located on the Saarland University campus and in close proximity to the Fraunhofer Institute of Non-Destructive testing and the Institute for New Materials (INM). SFI-MECS has no independent research premises but has a contract with the Saarland University for having access to all equipments of the University. Nanoforce is a UK-based company established as part of the UK Micro and Nanotechno­logy Network to develop processing technologies for nanomaterials. Nanoforce provides solutions to clients’ needs in technologies related to the polymer processing, ceramics processing, coating, printing, electrospinning, encapsu­lation, computer modelling. Nanoforce is involved in a broad range of materials processing research, which includes composites, polymers, ceramics, films, fibres. The focus is on new advanced processing technologies, which includes spark plasma sintering, electrospinning and inkjet printing. The focus of the research is the development of commercialisable processing routes for nanomaterials. The company has complementary technology in the field of ceramic nanomaterials with specialist processing such as powder synthesis and processing, sintering, including spark plasma sintering (SPS). Capability to work with air and moisture sensitive materials. Electrical characterisation including high temperature electrical conductivity, Seebeck coefficient and dielectric properties. Thermophysical properties, including TGA, DSC and thermal diffusivity. High resolution SEM and TEM. Microelectronics Group is headed by Dr. Alfredo Arnaud, composed also by 2 PhD students and one Master Student. Their field of expertise covers innovative design and construction of integrated circuits focusing on low energy consumption and other measuring devices. 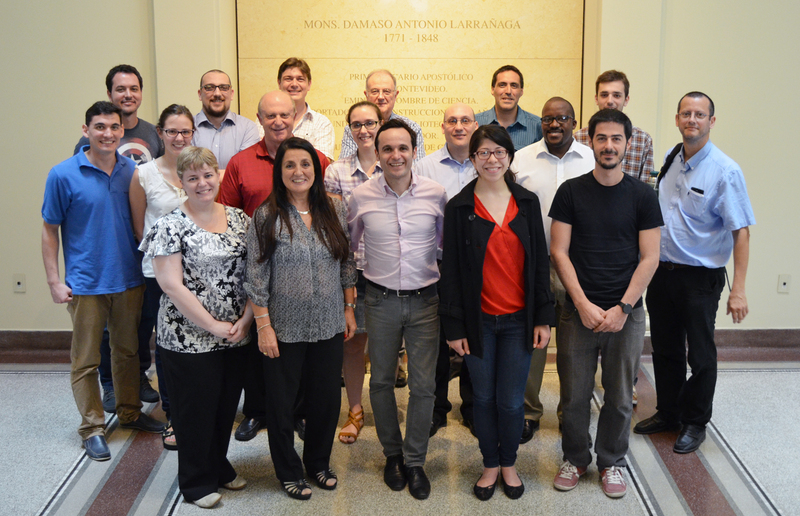 The Materials Engineering Group, headed by Dr. Ing. Martín Duarte Guigou and composed by a Post Doc and a PhD student, focuses on ferrous matrix composite synthesis, and mechanical and tribological characterization of materials. They started recently to work on the characterization of high temperature corrosion phenomena characterization on ferrous based composites. Materials Characterization: Optical Emission Spectroscope (OES) for chemical composition, metallographic laboratory, Frequency response and other electrical properties, High Temperature corrosion resistance and electrochemical properties. Mechanical Properties Characterization: Hardness, Tensile properties, Friction, wear and erosion resistance. Processing/structuring: Hot uniaxial press, cold pressing, electrochemistry lab (potensiostates, galvanostates, impedance); Characterization: SEM, TEM, WDS, EDS, X-ray diffraction, metallographic laboratory; Simulation: ThermoCalC, DICTRA and PRISMA software. The two participating groups are composed by 9 professors, 6 staff researchers, 8 post doc and 8 phD students. Research topics are ferrous metallurgy, tribology, metal corrosion and protection methods, materials for solar cells , bioelectrochemistry. Electrochemical measurements: potentiostats, galvanostats, impedance spectrometers; SPM electrochemical cell. Characterization: Raman, scanning electron microscopy, infrared spectroscopy, SPM, EDX, X-ray diffraction, Nanoindentation, Scratch and wear testing, UV-visible Spectrometer, micro and macro testing machines, specimen preparation and metallographic laboratories. The CSIR is the prime science council of South Africa. Materials Science and Manufacturing (MSM) is one of the 6 operating units of the CSIR. Prof K. Ozoemena’s research team comprises 7 Senior Researchers, 3 Junior Researcher, 2 Postdocs, 7 PhD and 2 Master students. The group’s research is highly interdisciplinary spanning several areas of Materials Science and Electrochemistry; from synthetic inorganic chemistry and electrochemical sensing to electrocatalysis and electrochemical energy systems In addition, CSIR is the host of the South Africa’s National Centre for Nanostructured Materials-NCNSM, which is headed by Prof Suprakas Sinha Ray and boasts of several state-of-the-art charaterisation facilities for nanomaterials. Synthesis of carbon and hybrid nanomaterials: hydrotherm. autoclaves, high temp. furnace in inert, reactive, oxidizing, or vacuum atmospheres, microwave system, electrochem. atomic layer deposition. The group works on the modification and characterization of wear resistant surfaces produced by ion bombardment, plasma nitriding as well as coating deposition via PVD and CVD. 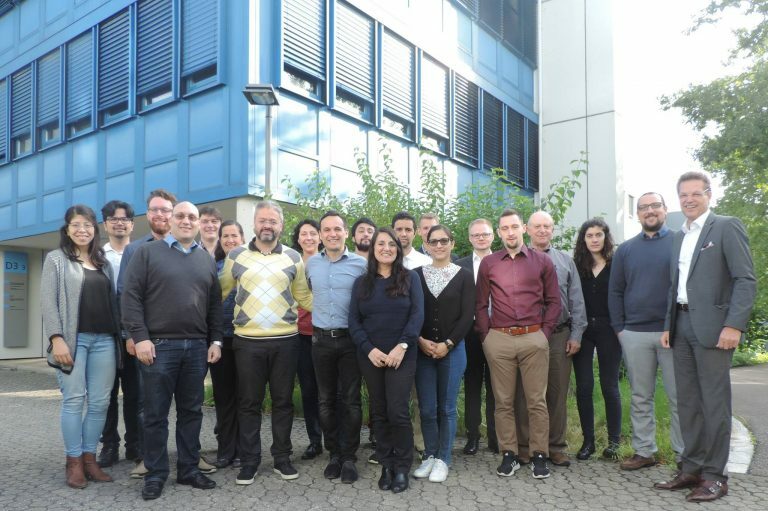 The group is also specialized in advanced non-destructive characterization techniques for microstructure and internal stress assessment using diffraction methods with synchrotron X-ray and neutrons. Characterization: SEM, XRD, Synchrotron XRD, optical perfilometry, nanohardness, pin-on-disc and scratch tests, dilatometry, mechanical testing under static and dynamic loadings. GaTech is a public research university in Atlanta, Georgia (USA). The Tribology Research Group at the George W. Woodruff School of Mechanical Engineering, has vast research experience across all disciplines of tribology. Recent focus has been on dynamics of rotating machinery, viscoelastic seals and dampers, non-destructive testing, diagnosis and prognosis of transversely cracked shafts. Current research projects are: investigation of elasto-plastic contact of rough surfaces using FEM; analyses of the stability and the steady-state responses of gas lubricated read/write heads of magnetic storage; mechanical seals in jet turbo-engines; wear failure of thrust washers in planetary gearests; and investigation of electromagnetic forces and surface thermoelastic stresses in an electromagnetic launcher, including electrical contact and magnetism under extreme current conditions. The School of MSE has SEM and TEM, to which the Tribology Group has access. Many other specialized rigs consist of mechanical seals testing, rotordynamics of cracked shaft, viscous pumps, trust washer tribological loading, analysis of hard disk coatings, and numerous rigs for the rheology of lubricants under high shear stresses and pressure.